One of our favorite plugin developers has just launched a recreation of one of the greatest filters of all time. It’s the 907A Fixed Filter Bank, which recreates the classic filter bank on the Moog Modular synth’s 907A module. If you haven’t had the chance to play with a real 907A, there are plenty of reasons to appreciate this elegant design with or without the nostalgia factor. 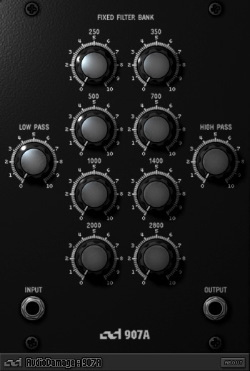 The 907A is just a simple array of useful filter knobs: high pass, low pass, and eight 24 dB filters at fixed points. The design was so useful that many Moog Modular users patch external audio through the 907A module, just to take advantage of its great design and sound. As usual, Audio Damage has been nice enough to make all of this MIDI controllable and learn-able. Fixed knobs + MIDI learn = easy performance with filters. It sounds great, and the price is right. What are you waiting around here for? Go enjoy it!